(A1) Characterization of waste PU and defining the processing parameters of the residue (UBU). 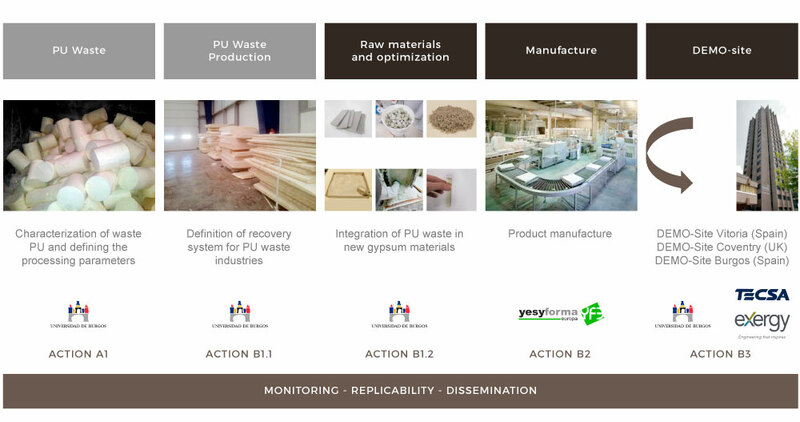 (B1) Integration of polyurethane waste in new gypsum materials with application benefits in construction, maximizing the reuse of waste. Defining the collection methodology at source and establishing the final material manufacturing optimization criteria (UBU). (B2) Manufacture of the prototype in the factory to produce gypsum-PU boards as a new line of business (YESYFORMA). (B3) Implementation (Pilot) of the new product in three buildings of different types in Spain and the UK. (UBU. EXERGY. TECSA). (B4) Introduction and reinforcement of environmental policies in the industrial and construction sector. Development of a “best practice manual”. (UBU. EXERGY. TECSA. YESYFORMA). (C1) Monitoring of the technical, environmental impact, Life Cycle Analysis (LCA) and socio-economic analysis of the project (EXERGY). (D1) Dissemination and communication of results. (UBU. EXERGY. TECSA. YESYFORMA). (D2) Technical dissemination of project activities. (UBU. EXERGY. TECSA. YESYFORMA).